To give the developers and testers additional faith that their proposed changes work successfully, it is advisable to build and test their code changes in the Pull Request before it is approved and merged into the Master branch. 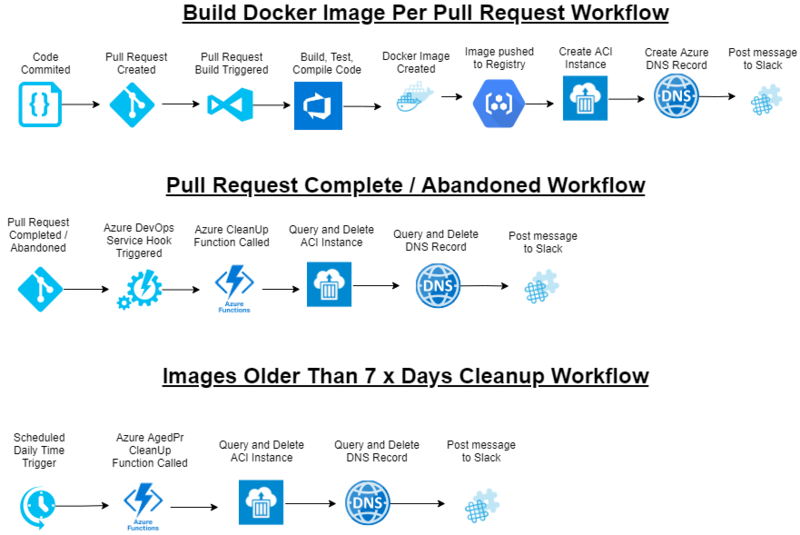 In order to achieve this we have setup a PR Build in Azure DevOps which creates a new Docker image using the code in a PR, uploads the image to the Docker Repo, runs the image in Azure Container Instances and creates the required Azure DNS records in order for you to communicate with it publicly and test your changes on a running app. The whole process follows a number of steps which I will go into more details below. As you can see from the above diagram there are 9 x steps in the workflow for creating a Docker image per PR per country. 1. Developer checks in code they have updated. 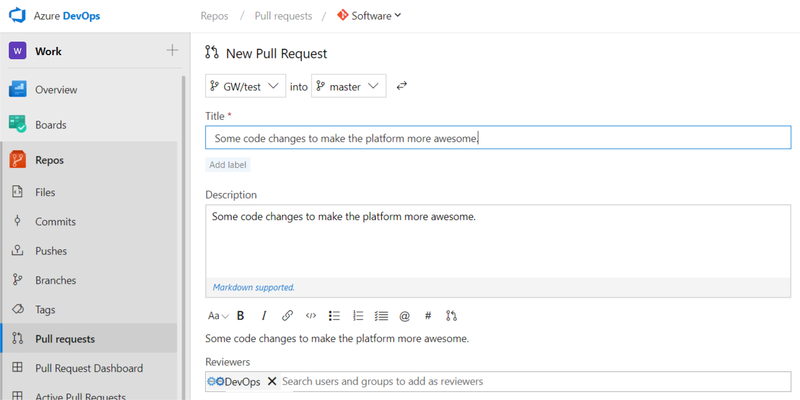 git commit -m "Some code changes to make the platform more awesome"
A Pull Request is created in Azure DevOps for the new code. 2A. The repositories target branch has a number of policies set on the master and develop branches. Require a minimum number of reviewers. Check for linked work items. Build validation. This ensures the listed build completes successfully before allowing a merge to target branch. The build added here, will be the build that creates a Docker Image and runs it per Pull Request. 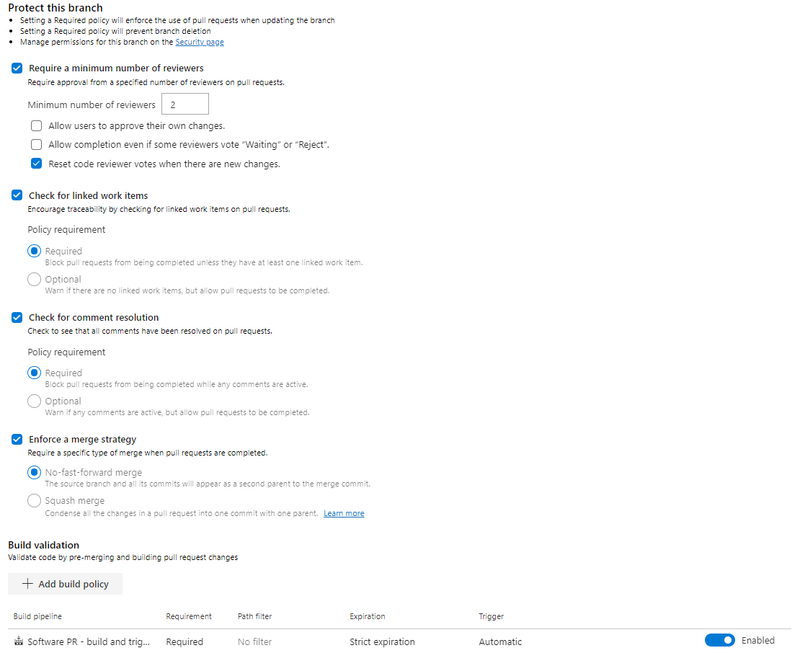 Find the branch your want to set the policy for and select Branch Policies button. Now when we finish creating the PR the PR Build will be triggered. You can see the status of all policies you have set from within your PR here. PR Build is now triggered and running the build definition you attached in the policy. Each project uses different languages, code etc and requires a different tools, to compile and test. So you’ll need to setup the build as per your coding requirments. After all those steps are completed and the code is compiled, tested etc, the resulting output can be added to a Docker Image for testing. Here we are using a combination of PowerShell scripts and Azure DevOps custom tasks to achieve the desired output being a running a container instance. docker build -t $tagImage . #These following three steps perform a transformation on the Web.config file by importing the file as XML transforming some key value pairs to the country specific varients, then building and pushing the required docker images. 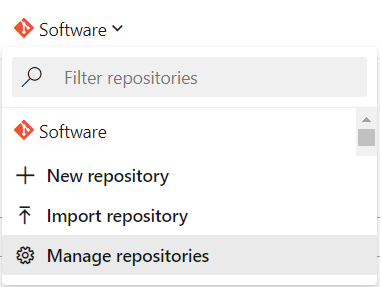 az login --service-principal -u="$ServicePrincipalID" -p="$ServicePrinicpalKey" --tenant="$env:tenantId"
az account set --subscription "Dev-Infrastructure"
#The following step is how to populate a variable in VSTS Environment, so the preceeding VSTS Custom Task for creating DRecords can check           its existence and evaluate whether to run or not. Step 4. Create Azure DNS Record For this step, we have created a custom VSTS extension in PowerShell utilising the AzureRm.Dns Module. In Step 3. we created a VSTS Variable called UK-Container this variable is used for the custom condition of this task. Because we may want to create DNS records for 3 x countries, or maybe just one. Step 5. Post notification message to Slack This is also achieved using a PowerShell script which has a number of custom modules to communicate with the VSTS API, which get the work items associated with the Pull Request and construct a custom message to post to a channel from a VSTS variable. 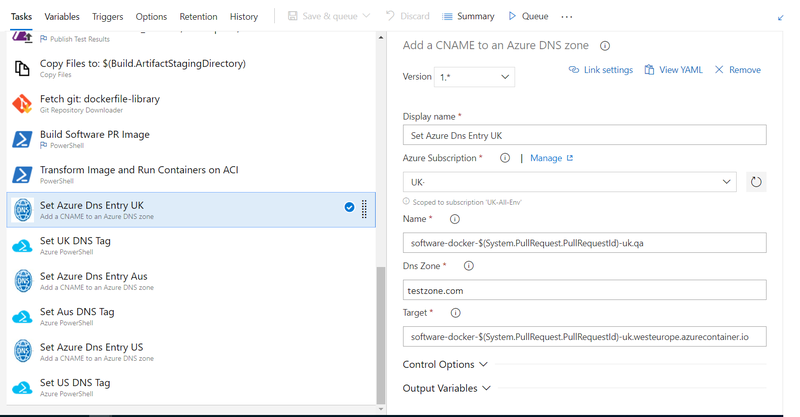 You now should have a docker image built using a VSTS hosted agent running in Azure ACI with an Azure Public DNS record and a notification to tell the Developers / Testers its ready for testing. Once the code has been checked and the image tested, the Pull Request will either be Completed or Abandoned. 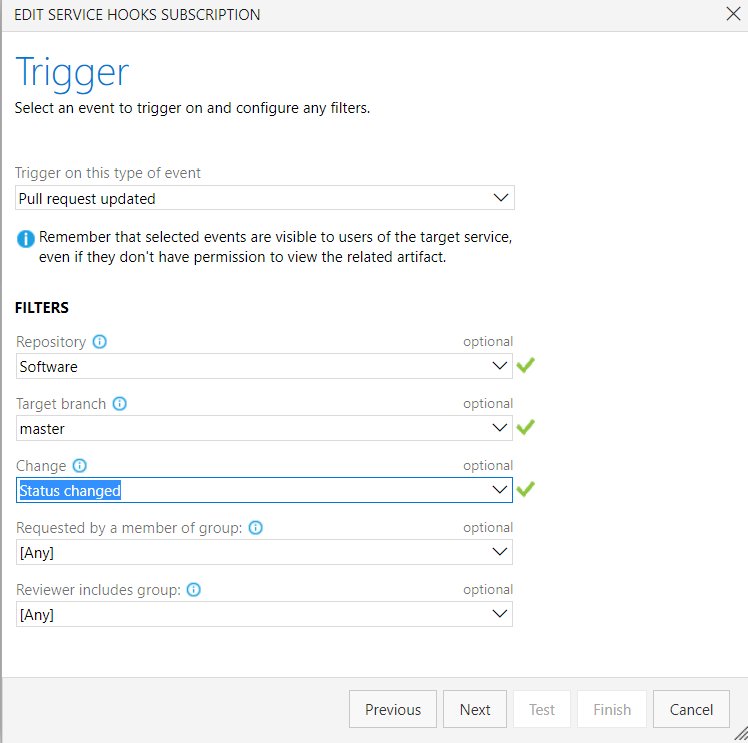 This will trigger VSTS to fire a service hook to an Azure function which deletes the ACI and Azure DNS Records, last step is a Slack Notification to tell the Developers / Testers it has now been removed. For this step we need an Azure PowerShell function to clean-up ACI and DNS Records. The function runs the following PowerShell script (Not actual code). Write-Output "Checking for all ACI Instances in ResourceGroup: $resourceGroup"
Write-Output "Resource Count is $($resources.count) "
Write-Output "Couldn't find any ACI instances"
Write-Output "ResourceName: $($resource.name) and DNSName: $($resource.DnsName) is about to be cleaned up"
$slackMessage = "Containers for pull request <$($pullRequestUrl)|$($pullRequestId)> has been cleaned up and is no longer accessible"
When you Complete or Abandon your Pull Request, the Azure DevOps Service Hook will be fired. 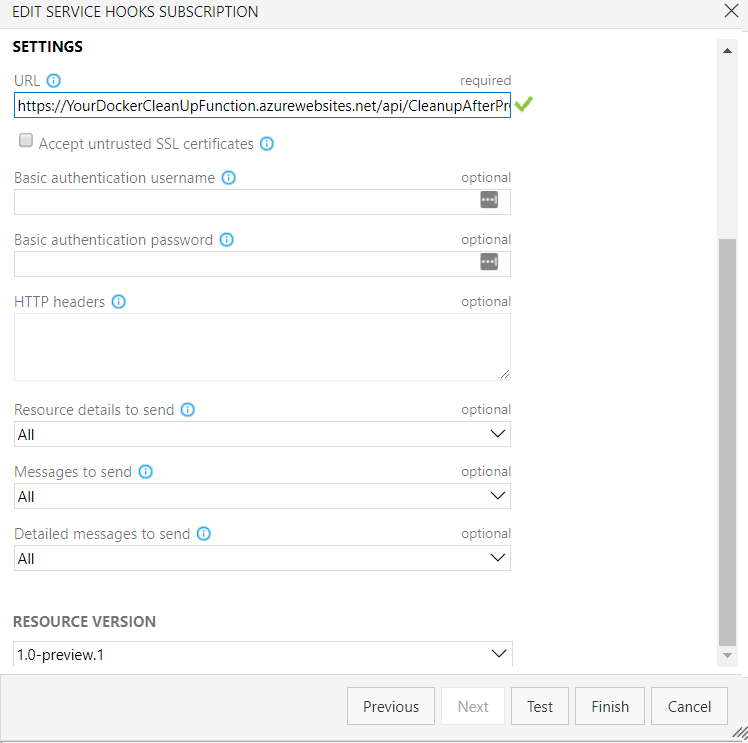 This will send the payload to your custom Azure function. The function will perform the actions. Notify Slack Container and DNS records removed. Similar to the last function, however this one is to delete aged ACI instances, if the trigger did not work, or someone left a PR open for a long time, there is no point leaving the container running, if they want to create it again, all that needs to be done is running another PR Build. This is triggered by a schedule, ran daily on an Azure function which deletes the ACI and Azure DNS Records, last step is a Slack Notification to tell the Developers / Testers it has now been removed. For this step we need an Azure PowerShell function to clean-up ACI and DNS Records. The function runs the following PowerShell script. $env:PSModulePath = $env:PSModulePath + ";D:\home\site\wwwroot\Modules"
Write-Output "Checking for all ACI Instances in ResourceGroup: $aciResourceGroupName"
Write-Output "CutOff Date for deletion is $cutOff"
Write-Output "Found the following instances that require removing:"
Write-Output "Cleaning up instance $($aciInstance.Name)." Write-Output "No DNS tag set up for this container, will not clean it up"
$slackMessage = "Container instance '$($aciInstance.Name)' has been cleaned up and is no longer accessible"
# Explicitly do nothing if we don't recognise the container that the ACI instance belonged to. The above script performs the following actions.